I have been obsessed with dining room lighting options for the last few weeks trying to find the perfect lighting situation for our future dining room. It all started in this post when I fell in love with Adelman's beautiful chandeliers. The Serge Mouille chandelier above is what makes this room have major personality. I am loving these large arched floor lamps and agree it would be fabulous as the lighting solution in a dining room. Here is another example of side lighting making a statement. I also like the look of several orbs floating above guests while dining. The Tom Dixon copper lamps that we posted about here would be beautiful in a cluster. A traditional chandy always looks good if the room is making a statement through its other parts, dark walls and heavy brass table in this case. 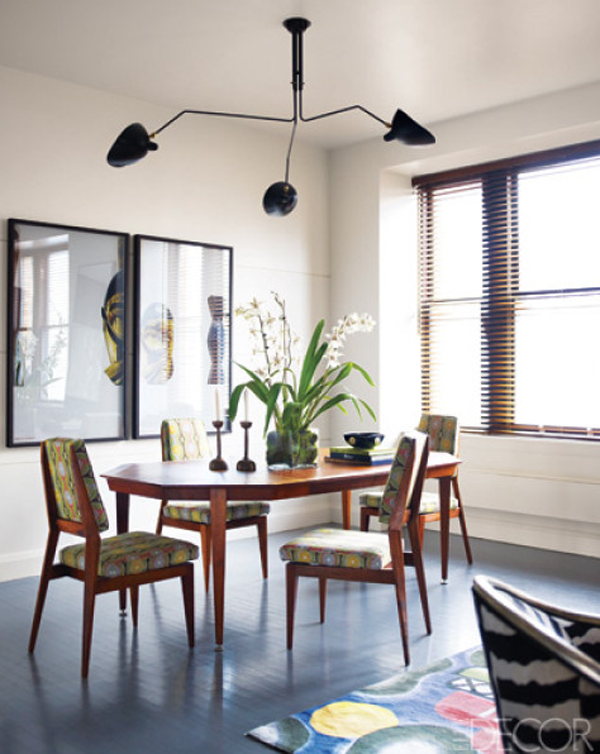 I love the look of using two hanging lights equally distributed above the dining table. I like that lighting here coming from a very decorative wall sconce. Two table lamps! This is fantastic! I'm not sure how the connection to the outlet would work and what we would do with the cable, but it looks beautiful. 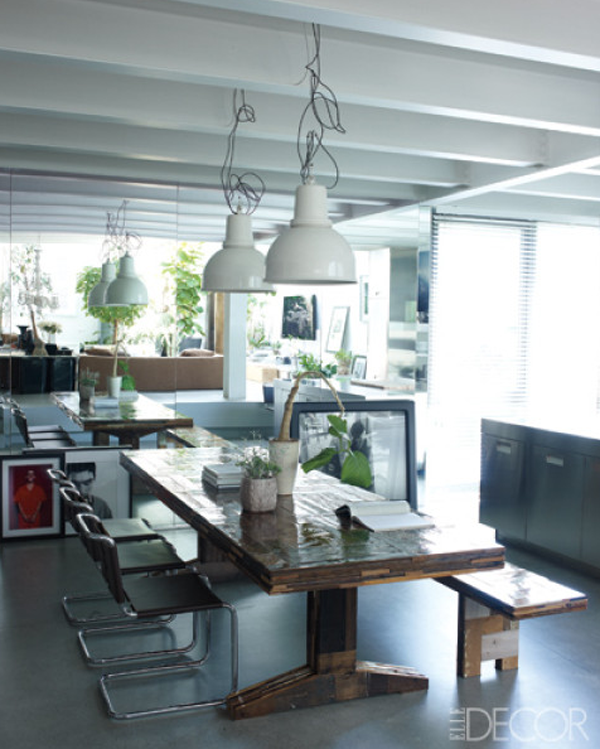 What kind of dining room lighting do you like best? Loving all the unique options here! I like that large arched floor lamp in the second picture. So cool! My favorite lately has been the arched floor lamp. It would be so unconventional in a dining room making it absolutely fantastic! Oh and of course the colorful orb pendants are great! I like the Adelman and the crystal chandelier! I saw a post on AT about converting a lamp into a battery operated one. I've got a soft spot for crystal chandeliers! The floor arched lamp is pretty cool too though! Pretty! I have no clue what kind of fixture I'd choose, but I'd lean toward something simple and timeless--lighting is pricey!!!! The Serge Mouille pendant is one of my all-time faves! Wish I could afford it. The chairs in that first pic are beyond amazing as well! I love that chandelier paired with those blue chairs. I would die for that dining room! 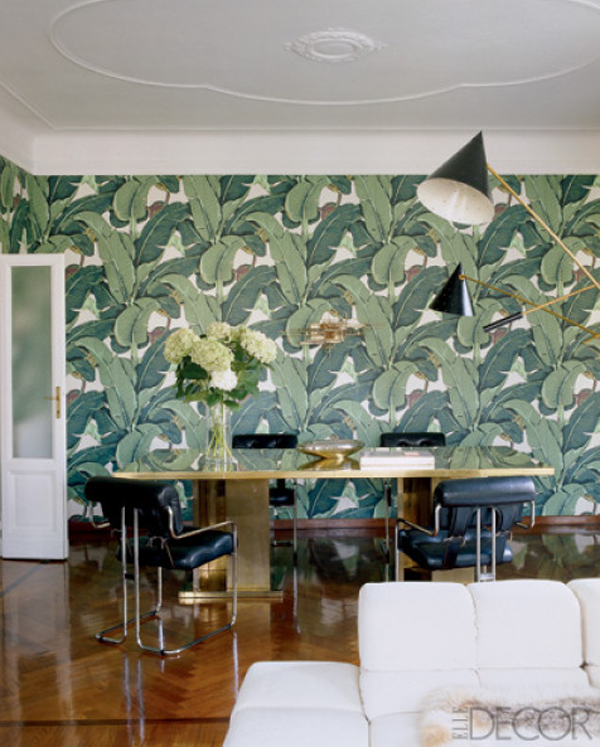 But if I really had to chose my fave room would be the n°5 for the brass accent and this gorgeous lacquer wall!!! No doubt! 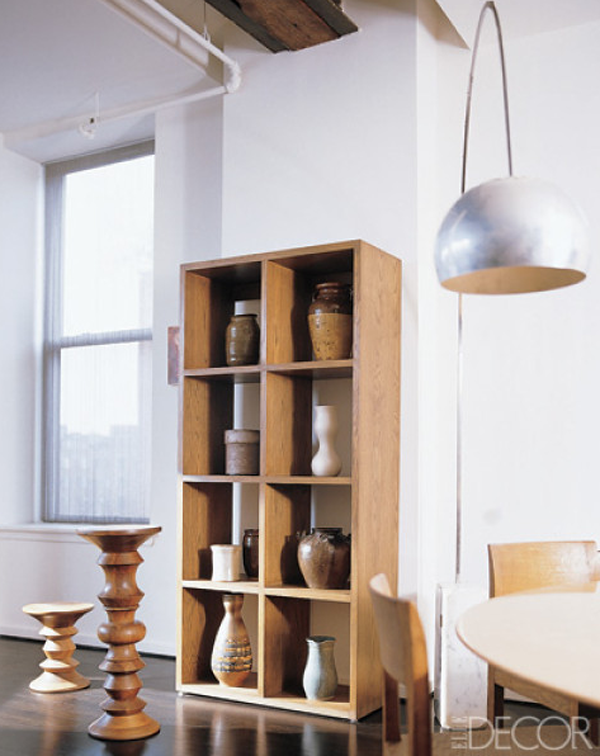 The space would not have the same take your breath away moment without that fixture! Love love love Serge Mouille lamps I follow you on GFC I hope you follow me too! Very, very pretty options. Love the idea of a huge floor lamp just because I don't see that very often! So much variety and all so quirky! Love how that first pendant looks like spider legs above the dining...perfect for clients who are all about sculptural elements in their home. 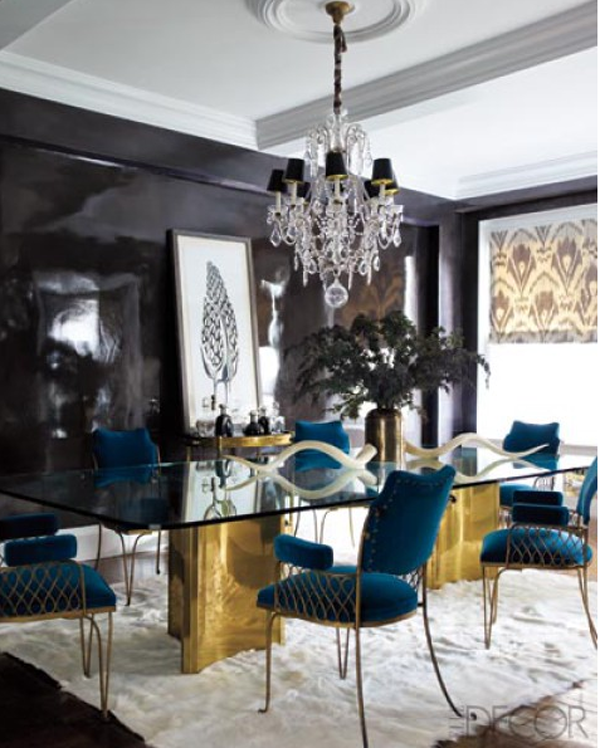 The Elle Decor shot with the black lacquered walls is right up my alley! A pinch of brass and it's ON! Gorgeous collection! they are all so interesting and different- thanks for the multiple perspectives on light! I love these. I'm looking for one, too. I have a very traditional crystal chandelier and very traditional furniture. I want something to freshen and add some fun! I like the first two images and I actually like the options of sconces and a dimmable chandelier or pendant of some sort. The good thing about Lindsey Adelman is that she gives directions and sources if you want to DIY her light, just in case you don't have an extra $10,000. It's really generous of her to do that. So many beautiful lights - love the arched floor lamps! Lightning can make all the difference!